Dual channel with separate shielding support 6Gbps uploading or downloading. Includes 6 red cables with locking metal latch. Backwards compatible with SATA I (aka Serial ATA I) & SATA II (aka Serial ATA II). 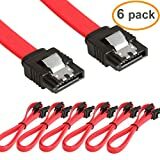 CableCreation SATA III Cable, [2-Pack] 8-inch SATA III 6.0 Gbps 7pin Down ..
SATA revision 3.0 (aka SATA III) provides up to 6 Gbps data throughput（Sata 7Pin Female To Sata 7Pin Female). 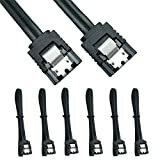 Includes 5 pcs Cables with Straight-through connector on one end, 90-degree connector on the other. Compatible with Serial ATA hard drives, Blu-ray/ DVD/ CD drives, and other Serial ATA devices. Easy to fit into hard areas and tight spaces, providing flexibility to posit. Backwards compatible with SATA revision 1 and 2 (aka SATA I and SATA II). Installing serial ATA hard drives, and DVD drives in Small Form Factor computer cases Server and storage subsystem applications High-end workstation drive installations Connections to SATA Drive Arrays One SATA connector One right-angled/90-degree SATA connector Supports full SATA 3.0 6Gbps bandwidth Compatible with both 3.5" and 2.5" SATA hard drives Provides 9" in cable length Applications and Solutions For use in servers and storage subsystems High-end workstations ATA Drive Arrays Mini tower computers Compatible with Serial ATA Hard Drives, CD-RW, DVDs, and other devices Fast and easy way to connect Serial ATA/150 hard drives to a motherboard Provides a fast data transfer rate of up to 150 Mbytes/sec Right angled cable connector easily fits in hard to reach areas and tight space Thinner and more flexible Serial ATA cable is easier to connect inside the system and improves airflow Package Contents 5pcs 9-Inch/23CM SATA III 6.0 Gbps Cable Warranty Limited Lifetime Warranty and Lifetime Product Support Please contact us if you are not satisfied with the item after receive it, we will give you a satisfactory solution before leave Negative Feedback or Customer Reviews. Your satisfaction is our greatest encouragement,Thanks for your support to our new store. Installing serial ATA hard drives, and DVD drives in Small Form Factor computer cases Server and storage subsystem applications High-end workstation drive installations Connections to SATA Drive Arrays One SATA connector One right-angled/90-degree SATA connector Supports full SATA 3.0 6Gbps bandwidth Compatible with both 3.5' and 2.5' SATA hard drives Provides 9' in cable length Applications and Solutions For use in servers and storage subsystems High-end workstations ATA Drive Arrays Mini tower computers Compatible with Serial ATA Hard Drives, CD-RW, DVDs, and other devices Fast and easy way to connect Serial ATA/150 hard drives to a motherboard Provides a fast data transfer rate of up to 150 Mbytes/sec Right angled cable connector easily fits in hard to reach areas and tight space Thinner and more flexible Serial ATA cable is easier to connect inside the system and improves airflow Package Contents 5pcs 9-Inch/23CM SATA III 6.0 Gbps Cable Warranty Limited Lifetime Warranty and Lifetime Product Support Please contact us if you are not satisfied with the item after receive it, we will give you a satisfactory solution before leave Negative Feedback or Customer Reviews. Your satisfaction is our greatest encouragement,Thanks for your support to our new store. SATA revision 3.0 (aka SATA III) provides up to 6 Gbps data throughput. 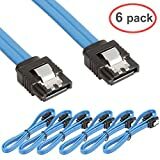 Includes 6 pack 18IN/46CM SATAcables with straight-through connector on both end. Installing serial ATA hard drives, and DVD drives in Small Form Factor computer cases Server and storage subsystem applications High-end workstation drive installations Connections to SATA Drive Arrays One SATA connector Compatible with both 3.5" and 2.5" SATA hard drives 18"/ 46CM length red cable For use in servers and storage subsystems High-end workstations ATA Drive Arrays Mini tower computers Compatible with Serial ATA Hard Drives, CD-RW, DVDs, and other devices Fast and easy way to connect Serial ATA/150 hard drives to a motherboard Provides a fast data transfer rate of up to 150 Mbytes/sec Right angled cable connector easily fits in hard to reach areas and tight space Thinner and more flexible Serial ATA cable is easier to connect inside the system and improves airflow Features Compliant with Serial ATA Specifications Fast data transfer rate of up to 150 Mbytes/Sec Meets current Serial ATA specifications and ensures maximum performance Offers 18 inches/46CM length for greater flexibility Specially designed to improve system airflow and routability Package includes: 6 x LINESO 18 Inch/46CM SATA III 6.0 Gbps cable red Please contact us if you are not satisfied with the item after receive it, we will give you a satisfactory solution before leave Negative Feedback or Customer Reviews. Your satisfaction is our greatest encouragement,Thanks for your support to our new store. Each major revision of the Serial ATA interface specification has doubled the maximum data transfer rate. The latest SATA Revision 3.0 allows for data transfer speeds of up to 6 Gbps. While the cables for all three revisions appear to be similar and will physically fit into the connectors on all SATA drives and controllers, the higher data transfer rate of SATA 6 Gbps requires higher quality materials and closer tolerances than the previous two revisions required. Monoprice SATA 6 Gbps cables are certified to provide maximum speeds from your SATA system, up to 6 Gbps when used with equivalent devices and controllers. Each end of this internal cable features a straight connector with an attached locking latch, to ensure that your connections do not come loose due to movement or vibration. 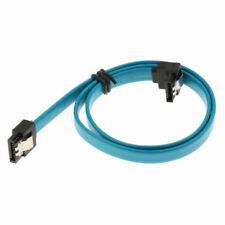 Note that SATA 6 Gbps cables are backwards compatible and can be used with SATA 3 Gbps and SATA 1.5 Gbps devices. However, the data transfer of the SATA subsystem will be limited to that of the slowest device. So, for example, if a SATA 6 Gbps cable is connected to a SATA 3 Gbps drive and a SATA 1.5 Gbps controller, the drive will be limited to a transfer rate of 1.5 Gbps. Serial ATA (SATA) replaces Parallel ATA (PATA, a.k.a. IDE) as the new standard for high speed, reliable data transfer between your computers motherboard and storage drives. SATA provides faster data transfers, less clutter due to a more compact cable, leading to better in-case air circulation and ability to hot swap connections.First generation SATA is generally referred to simply as SATA, but is also known as SATA 150 or SATA 1, has a thoughput of 1.5 gbit/s. It is an internal interface that uses "L" type connectors. They are referred to as "L" connectors because if you look at the female connector head on, it has a sideways "L" shaped slot. The male connector has an "L" shaped tongue.Second generation SATA is known as SATA 3 Gbps but commonly referred to as SATA 2 and sometimes SATA 300. It supports a 3.0 Gbps transfer rate and also uses the "L" type connector. 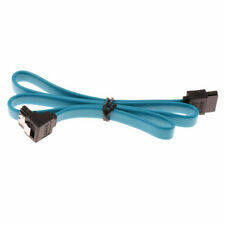 SATA 2 cables are backward compatible with first generation SATA devices. 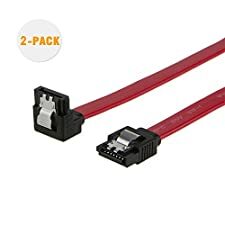 However, maximum throughput will be limited to the least common denominator.To go with the newer SATA interface, SATA drives usually employ a new 15 pin power connector as oppose to the older 4 pin Molex power connectors used on older system. However, some drives will have both types of connections for ease of installation into legacy systems.Here's where it can get confusing. For use with external devices, eSATA was developed with a completely different type of connector. eSATA uses "I" (letter i) type connectors because, as before, if you look at the connector straight on, there is an "I" shaped slot or tongue. Not to be confused with SATA 1 (#1) which some manufacturers will label SATA I (roman numeral i) which tends to confuse some users. 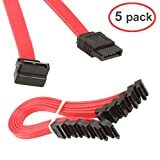 So a cable that is labeled as having type "I" connectors are for eSATA and not SATA 1 cables.eSATA has a maximum bandwidth of 6.0 gbit/s, same as SATA 3. But along with the new connector type, it also calls for a shielded cable. Though it has a faster transfer speed than USB 2.0 and Firewire 400/800 it has a shorter maximum range of 2 meters. MOTHERBOARD MATE SATA III cable is specifically designed to connect motherboards and host controllers to internal Serial ATA hard drives and DVD drives. BLAZING FAST SATA III SPEEDS up to 6 Gbps deliver superior performance for a custom gaming or RAID configuration; Provides secure connections for fast and reliable file transfers; Backwards compatible with SATA I, II, III hard drives. 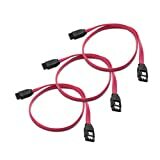 LOW PROFILE SATA cable has a flexible jacket to allow an efficient and organized installation in tight computer cases; Bright cerise colored cable provides easy identification when troubleshooting. 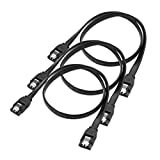 COST-EFFECTIVE 3-Pack SATA 3 cable provides spare or replacement hard drive cable for a last minute installation or to fix troublesome connection problems. COMPATIBLE with popular SATA equipped devices such as: Asus 24x DVD-RW Serial-ATA Internal Optical Drive, Crucial MX100 BX100 MX200 SATA Solid State Drive, Kingston240GB SSDNow V300 SATA 3 Solid State Drive, LG Electronics 14x Internal BDXL Blu-Ray Burner Rewriter, Samsung 850 EVO SSD 850 Pro SSD, Seagate 3TB Desktop HDD SATA 6Gb/s 3.5-Inch Internal Bare Drive, SanDisk Extreme PRO 240GB, SIIG DP SATA 4-Port Hybrid PCIe, WD Black Performance Desktop Hard Drive, WD Green Internal Hard Drive. SATA III cable is specifically designed to connect motherboards and host controllers to internal Serial ATA hard drives and DVD drives. SATA revision 3.0 ( SATA III) provides up to 6 Gbps data throughput. 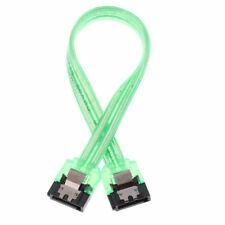 Latching Straight connector is an indispensable tool for securing difficult to reach connections in small cases; Low profile SATA cable has a flexible jacket to allow an efficient and organized installation in tight computer cases; Bright cerise colored cable provides easy identification when troubleshooting. Backwards compatible with SATA revision 1 and 2.
compatible with popular SATA equipped devices. DIY & IT Tech Tool with an Unbeatable Warranty The RELPER SATA 180 Degree to 180 Degree SATA III 6 Gbps Cable connects both newer SATA III and legacy SATA I, II drives to internal motherboards and host controllers. The straight connector has a latch to provide a secure connection in tight spaces. IT technicians always need a spare on hand as a troubleshooting tool. DIY gamers can quickly upgrade their computer for expanded storage. It is backed by a lifetime warranty and product support. 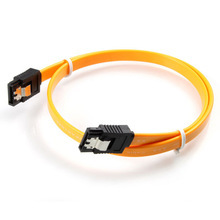 Important Note - Data transfer speed is limited by the rating of the attached equipment Cable Specifications - Connector : 7-pin SATA 180 Degree latching Receptacle "L" Type key connector - Supports SATA revision III up to 6 Gbps - Backwards compatible with SATA I, II ports Package Contents (6 Pcs) SATA Straight Cables Warranty Limited Lifetime Warranty and Lifetime Product Support Please contact us if you are not satisfied with the item after receive it, we will give you a satisfactory solution before leave Negative Feedback or Customer Reviews. Your satisfaction is our greatest encouragement,Thanks for your support to our new store. Each major revision of the Serial ATA interface specification has doubled the maximum data transfer rate. The latest SATA Revision 3.0 allows for data transfer speeds of up to 6 Gbps. While the cables for all three revisions appear to be similar and will physically fit into the connectors on all SATA drives and controllers, the higher data transfer rate of SATA 6 Gbps requires higher quality materials and closer tolerances than the previous two revisions required. Monoprice SATA 6 Gbps cables are certified to provide maximum speeds from your SATA system, up to 6 Gbps when used with equivalent devices and controllers. Each end of this internal cable features a straight connector with an attached locking latch, to ensure that your connections do not come loose due to movement or vibration.